In any case, I promise this will be my last Christmas post of the year, which should be an easy vow to keep, since it’s already the 28th. In a previous post, I wrote about the date of the nativity. This time we’ll look at the year of Jesus’ birth. Considering all the ink scholars have spilled over this subject, and all the contortions many of them have gone through to push for specific dates that “work” (even so far as to move the death of Herod to 1 BCE), it’s a wonder there is a consensus. And yet, almost everywhere you look, you’ll find the date range of 6 to 4 BCE. The kernel in this spoiled repast, this botched banquet, is the fact that both evangelists mention Herod. So it “must be” historical. Once you whittle away the stuff that can’t be true, you’re left with the stuff that has to be true. This historical treatment of the nativity ranks as number one on my list of “why-would-anybody-make-it-up?” arguments. Witherington notes that the prophecy in Isaiah simply says a young woman will conceive. And even if the Septuagint used the word “virgin,” he argues, there is no need for her to remain a virgin after the conception and after the birth. Notice, by the way, that nearly every English translation of Isaiah 7:14 uses the word virgin instead of young woman — even the great NIV, which promises it follows the Hebrew text faithfully throughout the OT. Well, they try to follow the Hebrew, but sometimes the Greek just makes more doctrinal sense. Besides, who wants to stir up those easily triggered American Evangelicals? Anyhow, Pastor Ben says Jesus’ birth “must have” occurred in unusual circumstances. It works in other contexts, too. Why wouldn’t Joe Smith just say he found the golden plates while digging a well? Why add more implausibility to the account by saying an angel visited him? Clearly, Moroni “must have” really come to see him and directed him to the spot. No other explanation makes sense. Why would anybody invent a story about Xenu blowing up volcanoes? Surely, if L. Ron Hubbard wanted his followers to believe the story, he wouldn’t have added to the implausibility by making the spacecraft look like DC-8 aircraft. It must, therefore, be true. Who knows what other “facts” might be rescued from history’s dumpster? Stay tuned. We live in interesting times! Posted on 2017-12-28 23:34:10 GMT+0000 by Tim Widowfield. This entry was posted in Apologetics, Historical Methods, Historical Sources and tagged Historical Jesus. Bookmark the permalink. I can’t believe that you are such a simpleton. Really. I don’t think I can continue to read your articles. Unless, of course, your standard of argumentation rises rapidly and significantly I will be ‘out of here’. Can you help us out by identifying what you see as the specific flaw in Tim’s post? I will miss you terribly, stranger. Actually, I apologize for being glib, Ian and June. If you need me to explain anything to you, I will try to oblige, time and weather permitting. Incidentally, if you were worried that I was arguing for the existence of Xenu and his spaceships or for the historicity of Moroni’s visit to Joseph Smith, rest assured that I was being sarcastic. I was trying to demonstrate that an argument for historicity based on what we think people would or would not invent does not work. New religions aren’t concerned with plausibility or believability, especially those that rely on the magic of miracles to thrill their followers. You mean, rises above name-calling? There are a couple of different flavors of this argument. One is the so-called “criterion of embarrassment,” which is used to justify the belief that the crucifixion occurred. The idea is that being executed this way was something that Jesus’ followers ought to want to cover up, and since they couldn’t, they had to own it. This isn’t the same as embellishing the event with even more fantastical features, which I believe is the core of your argument. Of course, the argument can get around this by observing that the Crucifixion is a certification by the Roman authorities that Jesus was a dangerous revolutionary, hence it could be regarded as an embellishment, and not subject to the criterion of embarrassment. There are two arguments I was making. First, critical scholars who think the nativity stories are wholly legendary will still often say that Jesus was born between 6 and 4 BCE, not remembering that those dates are based on legends. Second, the idea that something is more likely be true because people would not invent implausible stories flies in the face of experience. We’re not dealing with a liar who is trying to invent a convincing alibi; we’re dealing with believers who see visions and read scriptures to find out what did and will happen. Judging from these references many early “church fathers” were not unduly bothered by birth dates, averaging between 3 and 2 BCE, that had nothing to do with either Quiraneus’ census or the lifetime of Herod the Great. 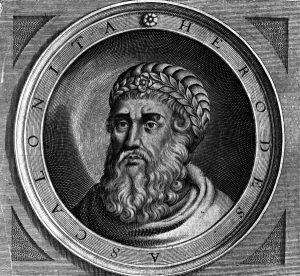 The time period 3 to 2 BCE coincides with the War of Varus which followed the death of Herod. They were writing before the Christian legend was completely locked down and made canonical. Perhaps the “scholars” should start looking beyond the canonical Greek texts and start examining Ethiopic, Armenian, Georgian, early Arabic, Garsoni, Coptic and Aramaic texts not written under the influence of post Nicean dogma or over-written by post Theodosian theocratic censors. Attis was castrated- ouch, that hurts. I mean to say, his followers wouldn’t make that up would they? Actually my favourite ‘how embarrassing’ verification of myth as real is the story of the Japanese god Susanoo who was created from ‘washing of the nose’ or, in a more prosaically worded version, nasal snot. This is similar to a story from the Haida in the Pacific Northwest in which Frog Woman makes herself a “snot boy” with which to amuse herself. And thus was ruined the Heavenly keyboard. I’m still leaning towards Jesus being a title given by non-Essenes to their ‘teacher of righteousness’ some century or so before the supposed birth of Jesus. Of course, said teacher must have been damned health to still be around in 49 CE to be a problem in Rome as Chrestus. The Septuagint “parthenos” explanation is most likely the best source for the Matthew/Luke “virgin birth” story, but both the New English Bible (Protestant) and the New American Bible (Catholic) have the “young woman” translation for the Isaiah passage. But where do either of them say she was still a virgin after he baby was born? Also, Matthew only assert that Joseph had no sexual relations with her until after the birth, but not that he did not do it after, and Luke only talks about an angelic intervention in the conception, similar to Elizabeth (also Sarah in the story of Abraham). That does not even mean that Joseph had nothing to do with it. Perhaps it means to say that Mary worried that she may not be able to conceive? She was only virgin until that time?